I'm always trying to think of new ideas for chicken. Last weekend I needed a little help so I asked the girls on the What's Cooking board for some suggestions. I decided to go with this recipe from Elly's blog. Below is the original recipe with some of my own notes added in. Preheat your broiler; broil the poblano for a couple minutes (took 12 minutes for me) turning it once the skin has blistered and blackened. After all sides of the pepper look charred, remove it from the broiler and put it in a bowl. Cover the bowl with plastic wrap (to sweat the skin off) and set aside. When the pepper is cool enough to handle, peel the skin off and dice it. Slit a pocket into the chicken breasts and stuff with the diced poblano and cheddar cheese. (I used a toothpick on each to keep the pocket closed) Sprinkle chicken with salt and pepper. Combine the cornmeal with salt, pepper, paprika, and cayenne to your tastes. Dip the chicken in the egg wash and then dredge in the cornmeal mixture. Place the chicken on the rack and spray the top with cooking oil (I used a baking dish instead). Bake about 20 minutes or until done, turning once in the middle of cooking. I thought this chicken was good, but just a bit dry. I think next time I'd roll my chicken instead of making a pocket so the filling would be layered. See this recipe in my blog for instructions on rolling chicken. 1.5 cups chopped veggies; I used red pepper, green pepper, and red onion. Anything would work. 1/3 cup shredded cheese; I used cheddar to go along with the chicken. Heat butter in a pot; add orzo and stir until coated. Add water, bring to a boil, then cover and turn to low. Let cook for 20 minutes until the liquid is absorbed. Don't stir it until the end. When the orzo is about done, heat oil in a pan. Add veggies, salt, and pepper. Saute for 3-4 minutes, or until tender. Add the veggies, cream, and cheese to the orzo. Stir. I really liked this and want to try it again with some different veggies and different cheeses. 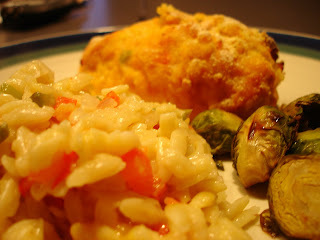 This is a great way to have something that has a similar texture as risotto but without all the stirring. 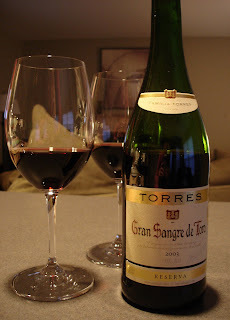 While cooking and during dinner we enjoyed a bottle of wine that my sister brought home from Spain a few months ago. It was light tasting for a red and went really well with the spicy flavors in the chicken. Thanks Stacy!